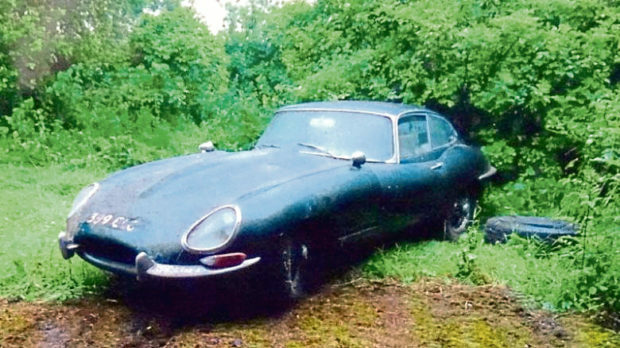 The rare 150mph E-Type coupe originally cost around £2,000, but was put into storage in Moray in 1983 and forgotten about. Rediscovered earlier this year, the two-seater’s racing green colours only emerged after it was cleared of more than three decades of dust. One of just 1,799 right-hand-drive models ever produced, survivors are now highly sought-after. Described as a “sleeping beauty”, the rare Jag was sold at H&H Classics’ auction in Buxton, Derbyshire, where it nearly doubled its £30,000-40,000 estimate. It was eventually bought by a collector in the room after a bidding war with rivals on the internet. Roger Nowell, of H&H Classics, said the vehicle was “an iconic symbol of its time”. He added: “The joy of this job is that, now and then, you stumble across a car that you just know is going to excite other car lovers as much as it excites you. The Jaguar E-Type was manufactured between 1961 and 1975. Its combination of style, supercar performance, and competitive pricing established the model as an icon of the motoring world. Regularly described as the most beautiful car ever made, the E-Type was based on Jaguar’s D-Type racing car, which had won the 24 Hours of Le Mans three consecutive years from 1955 to 57. It went from 0-60mph in less than seven seconds and hit a top speed of 150mph. Jaguar E-Type owners included Rat Pack leader Frank Sinatra, actors Steve McQueen, Tony Curtis and Brigitte Bardot, Beatles musician George Harrison, pop star Roy Orbison and footballer George Best. More recently, they have been seen in films like Austin Powers and the television series Mad Men.